What It’s About: Five passengers and two crewmen on a pleasure cruise shipwreck on a lonely island with limited food supplies. In a ship’s log on an old research vessel they discover a warning against eating the only abundant local food source, mushrooms. How long can the group hold out from eating mushrooms; and what is the secret of the strange figures they repeatedly see in the mist? Why Watch it Today? : Today is one of the hard to pin down food based holidays that show up on many “On Today’s Date” calendars: National Mushroom Day. 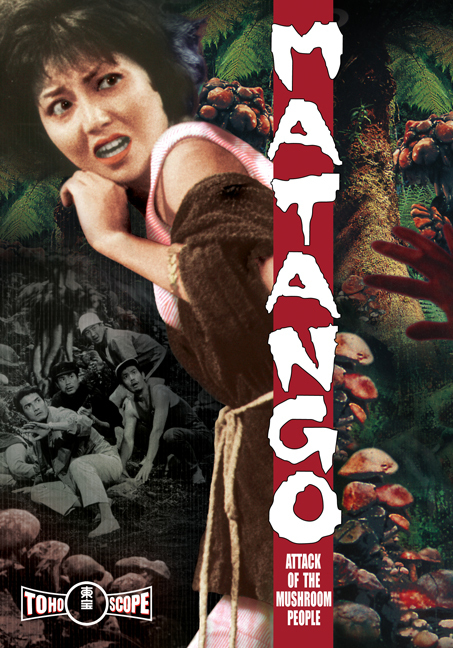 A fiction or not, it’s a perfect excuse to watch today’s film, one of the stranger Toho efforts whose choppy American edit haunted me for years after I saw it, like a strange fever dream that you can never quite remember the details of. This entry was posted in Adaptation, Based on a Short Story(ies), Drama, Horror, Killer Plants, Movie of the Day and tagged addiction, AIP, Akira Kubo, allegory, Eiji Tsuburaya, fungi, hallucinations, Hiroshi Koizumi, insanity, Ishiro Honda, it's not over, James H. Nicholson, Japan, Kenji Sahara, Kumi Mizuno, lone survivor, movie stars, mushrooms, musical interlude, radiation, sailors, Samuel Z. Arkoff, scientists, shipwrecks, Takeshi Kimura, temptation, Toho, Tomoyuki Tanaka, transformations, twist, William Hope Hodgson.